To remain competitive in today’s hotel marketplace (where everything seems to be getting more luxurious by the day), Intercontinental Hotels Group, which owns the Holiday Inn chain, has announced a $1 billion facelift of the 3,000 Holiday Inn properties worldwide. Moving away from the roadside motel feel, the company is seeking to reclaim a top spot among mid-range accommodations with updated welcome/check-in areas, guest rooms with triple-sheeted bedding and two pillow options (soft or firm), and sleek new bathrooms with improved shower heads and curved curtain rods. The brand is also adopting a new logo: a white uppercase H over a green background. The renovations will be implemented over a three-year period, with local operators expected to contribute $150,000 toward the new improvements. Look for the new logo to determine if a property has been upgraded. If you see the old logo, chances are that hotel is still in transition. 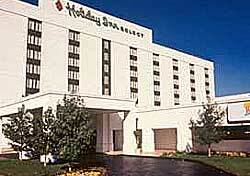 For more information on the upcoming changes, visit the Holiday Inn website.